This is the most natural food diary, entering foods like in a spreadsheet. You simply tap a row and start typing food name, the app will show foods found, then you select amount. You do all food entry in-place, without going back and forth between many screens. Food entry is faster than on the iPhone! You can see the big picture on the same screen - all nutrients, all totals, for all meals. Simpler and easier navigation - the app has only 6 tabs. Beautiful iPad design, a true pleasure to use. The best thing is that you can continue using MyNetDiary on the iPhone when you are away, and comfortably use the iPad app when you are back home on your sofa. The apps work together and sync automatically without any extra effort on your side. MyNetDiary for iPad has been selected as Apple Staff Favorite! "Of all of the food and exercising apps out there (and there are a ton of um...) this one clearly stands out among the crowd. And, believe me, I've tried many of them. MyNetDiary is the perfect balance of intuitive interface, ease of use, tracks everything, unfailing food database results. [...]. - Mark De Lorenzo." "I have always wanted to track my daily calorie intake but it was always so cumbersome. With this app and my iPad it is a piece of cake. [...]. - Josh Nelson IMC." "I've used this program for 5 weeks on my iPhone & purchased this last week for the iPad. All things considered this is a phenomenal app. [...]. - ssipsgirl." "MyNetDiary is an awesome app. It's easy to use and I love that it tracks my water intake. I have no complaints. In fact, I use it every day that I made it one of my top 6 apps on the bottom of my iPad. [...]. - todzsm17." MyNetDiary stores all food diaries online, so there is no risk of losing data. Make sure you have a MyNetDiary account and you know your account name and password. 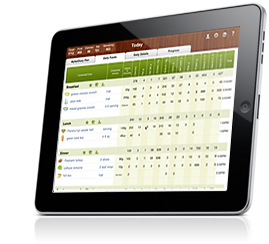 Then you can access your food diary from the iPad app, or online, or from our Android apps. As the first step, please make sure you have created a MyNetDiary account. You can check iPhone app's Settings screen. If it says "Create Account", then tap this row, select you account name and password (we also recommend providing your e-mail so that you'll be able to recover your password if lost), and tap "Create". Once you know your MyNetDiary account and password, get MyNetDiary for iPad from the App Store either searching for MyNetDiary or with following link: iPad HD app. Finally, after you have the MyNetDiary iPad app installed, launch it, select "Sign In" option and then sign in with your account name and password. 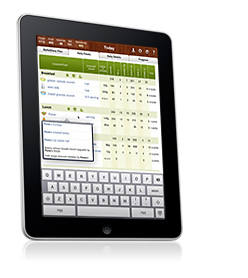 You will see your food diary in the iPad app. iPad HD app is available on the App Store for $9.99. There is no better, easier, or more comprehensive way to lose weight and manage your diet on iPad than with MyNetDiary iPad HD app.